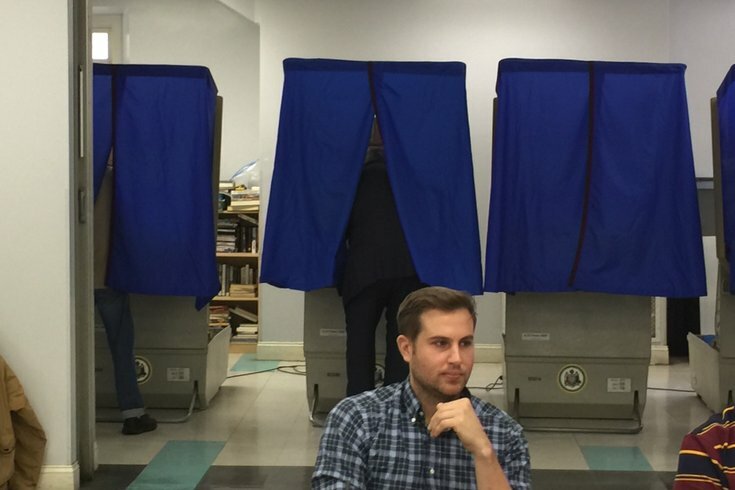 Jim Kenney, the Democratic candidate for mayor, stands behind the curtain of a voting machine at his polling place inside Old First Reform Church, Third and Race streets. Thousands of Philadelphia voters may have hit a snag at the polls on Election Day last fall, a report found this week. Keystone Votes, a nonpartisan coalition of state groups pushing for election reform, found that nearly 56,000 registration applications from state residents weren't finalized by counties until within eight days of the Nov. 8 general election. Some 26,000 of those — including 17,000 submitted by Philly residents — were ultimately added to the rolls, but likely too late to receive a voter identification card or appear in the main poll book. This may have left those people unable to vote, the study found. City Commissioner Lisa Deeley told the Philadelphia Inquirer this week that 17,000 sounded unusually high, and that she needed to investigate before commenting further. "We are in [the] business of franchising voters, not disenfranchising voters," she said. More than 3,000 Montgomery County applications also were processed late, the report stated. Additionally, the study cited a report from The Committee of Seventy and volunteers from the University of Pennsylvania School of Law, in which 13 percent of 2,149 registration applications taken from non-partisan voter registration drives throughout the state were not valid, and therefore not added to the registration rolls. "It is alarming that 19 percent of valid and on-time applicants may have never been registered to vote," the study states. In 2016, more than 195,000 voters across Pennsylvania who tried to apply for voter registration or change an existing registration were denied. More than 30 percent forgot to fill out just one item on the form, the study finds. "How any registrations could have easily been approved if counties had more leeway to address obvious omissions?" the study read. The report urged a remediation plan for election reform in Philadelphia, as well as an investigation into just how many voters may have been disenfranchised last fall. Fourteen nonpartisan organizations who collected about 25,000 voter registration applications among them asked Keystone Votes to conduct a study to determine what may have happened, the organization stated. President Donald Trump took Pennsylvania by about 44,000 votes on Election Day, becoming the first Republican to win the state's popular vote since George H.W. Bush did it in 1988.